Be guided through the saltwater backcountry lagoons. Fish nearshore coastal waters off Cape Canaveral’s beaches. Experience Florida’s best Deep Sea Fishing Adventures. E ach morning I leave behind the trace of land for the clean early morning smell of indigo waters on a deep sea fishing charter. We let flying fish and frigate birds lure us offshore to unfathomable depths where reefs and shipwrecks gather hordes of fish. On other days I explore the mangrove shorelines and grass flats on vast, remote lagoons for inshore game fish. My Cocoa Beach fishing charter will transport you to timeless backcountry waterways where manatees and dolphin feed and play. Join me for one of these adventures only minutes away from Orlando, Disney & Universal Studios. Anglers of all skill levels from newcomers to aficionados are welcome; it’s not required to be an expert, although, I am known for high-performance fishing. As a family man, I enjoy having teens and children. We welcome you aboard and will do everything possible to make your Orlando fishing charters trip a fun and successful adventure. You will be swiftly transported in my 18-foot shallow water inshore flats boat to a remote fishing destination on one of our lagoons. You might fish the Mosquito Lagoon, Indian River, or Sebastian Inlet area. 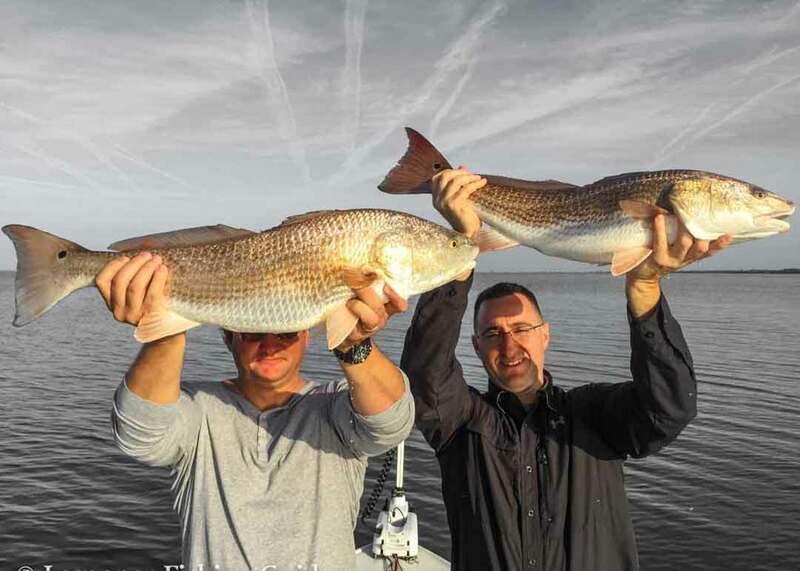 The inshore game fish we often target are redfish, snook, tarpon and spotted sea trout. My Coastal and deep sea fishing Orlando trips depart from Port Canaveral. On our deep sea boat, we will launch quickly to exclusive fishing destinations including reefs, wrecks, and other fishing grounds. A few of the deep sea sportfish we have in our area include kingfish, cobia, sailfish, mahi-mahi and more. Growing up on the water and fishing the area my entire life, I look forward to getting you on board. I’m not a “Fishing Charter Company” claiming to be a family run business. It is myself and my wife, Gina, we don’t hire other guides to run our boats. However, it is important to me to stay well connected with changing conditions and keep great relationships with other local, reputable charter captains. Lagooner Fishing customer’s testimonies and their repeat business speak for themselves. When you meet me at the docks, you can be assured I will be taking you fishing for the day. Share your photos and your fishing adventures with #LagoonerAdventures and follow @lagoonerfishing to be seen.